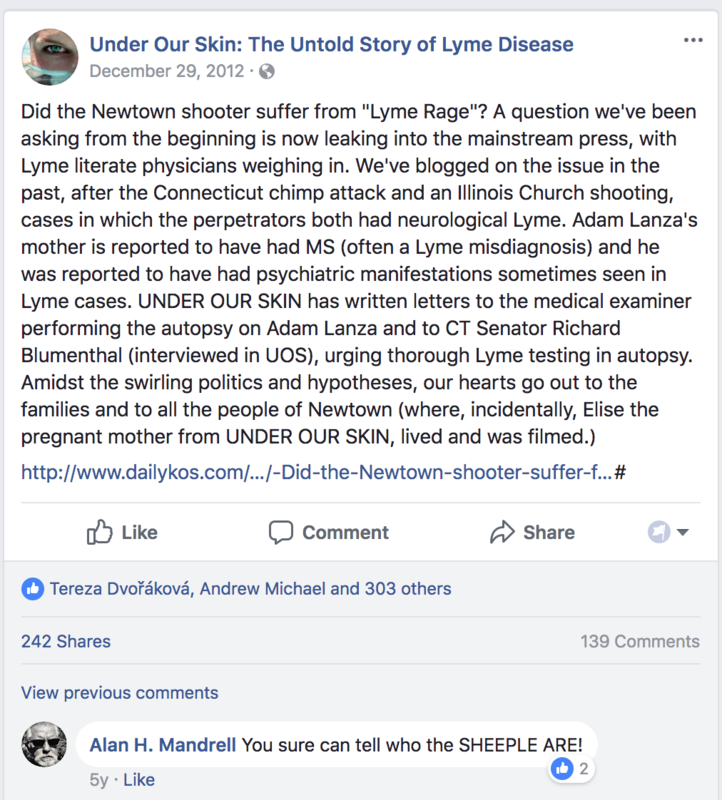 Under Our Skin is one of the most popular propaganda films for chronic Lyme conspiracy theories and quacks. 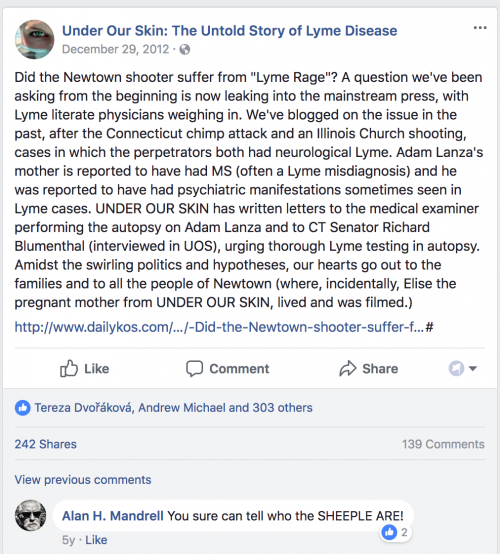 In 2012, a post on the film’s Facebook page attempted to connect Lyme to various horrific acts of violence, such as the shooting at Sandy Hook Elementary School in Newtown, CT. There is no scientific support for “Lyme rage” — though it doesn’t matter since most people who think they have fake diseases like chronic Lyme never had Lyme disease in the first place. 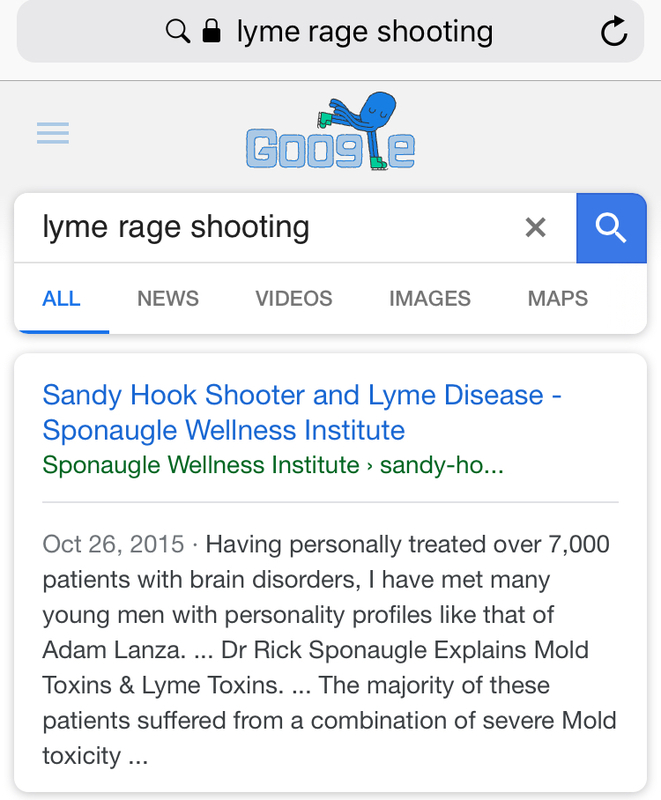 My clinical research has proven that most rage filled patients suffer from a brain that is severely over-electrified because it is full of toxins, usually Mold toxins and Lyme toxins. All Americans suffer some degree of brain saturation with fatty toxins, from pesticides, food toxins and industrial toxins. Because our brain is the fattiest organ in our body, 60 percent fat, fatty toxins after entering our body, migrate to and deposit in the brain. This phenomenon is called neurotoxicity. So is this the one true cause of all disease? Sponaugle has no legitimate credentials in infectious diseases. What differentiates a mild level of neurotoxicity suffered by the average American as compared to a more severe level capable of causing rage, in my patients, has proven to be Mold Toxicity and Lyme disease. A subset of Americans, particularly red headed, fair skinned people like Adam Lanza, often have genetics that prevent them from effectively removing Mold toxins and Lyme toxins. I have personally treated over 2,000 patients, who because of rage issues, were previously misdiagnosed by Psychiatrists as having a genetic Bipolar disorder, when in fact, their rage issues were caused by a brain full of toxins. The majority of these patients suffered from a combination of severe Mold toxicity and Neuro-Lyme disease, in addition to a Bartonella co-infection. After several weeks of treatment for Mold Toxicity, Lyme disease and Bartonella, Kevin once again became a tender and gentle spirited young man. To drive home this point, he features a “before” photo where Kevin is not smiling and an “after” photo where Kevin is smiling. That’s not good evidence of anything. When psychiatrists fail to diagnose neurotoxicity in their anxious patients, over time, those patients accumulate additional brain toxins and eventually, the patient’s symptoms progress from anxiety to panic disorder, and in severe cases, uncontrollable rage. As his brain continued to become saturated with bio-toxins, Adam’s anxiety and detachment would have progressively worsened, he would have progressed into a state of panic and then, when he could no longer contain it, explode in an outward fashion, as he did, with uncontrollable rage. I sincerely believe the likelihood that Adam suffered from undiagnosed Lyme disease is extremely high. I diagnose Lyme disease in 95 percent of my patients with Adam’s personality profile. The Lyme spirochete migrates to the brain within 12 hours of a tick or mosquito bite. I have a very large Lyme practice and rarely ever see panic disorder and Asperger’s patients who don’t have Lyme infections. Multiple studies have proven that Lyme and Bartonella are responsible for causing Autistic Spectrum disorders. No, Lyme disease and Bartonella do not cause autism. Based on my experience in treating kids with Asperger’s, I suspect Adam was a sickly kid who had quite a few rounds of antibiotics from his pediatricians. My clinical research has matched the brain scans of Asperger’s patients with specific brain chemistry deficiencies that are derived from antibiotic-induced gut toxicity. America’s Psychiatrists have got to come out of the Freudian dark ages, they can no longer remain ill-knowledgeable regarding the fact that environmental toxicity, which is ever increasing, and brain infections from emerging epidemics of Lyme disease and Bartonellosis, are becoming more prevalent in the causation of psychiatric disorders. Until the field of Psychiatry advances with modern neuroscience, misdiagnosed patients like Adam Lanza will go untreated and commit more mass murders every decade.